Hrs: 0600-2100 MON-FRI; 0800-2000 SAT & SUN. APCH/DEP SVCS PRVDD BY JACKSONVILLE ARTCC ON FREQS 134.3/353.5 (DOTHAN RCAG) WHEN CAIRNS APCH/DEP CLSD. FAA Terminal Procedures valid from 0901Z 04/25/19 to 0901Z 05/23/19. A110-1 MAXI TWY WIDTH FOR RWY 14/32 IS 75 FT.
A110-2 RSTD: USAF NOT AUTH TO OPER C130 & C135 ACFT ON RWY 18/36. A110-4 ARFF PSNL ON DUTY AT ARPT 24 HRS. A110-5 FUEL A, A+ (C334 983 4541) (NC 100LL). 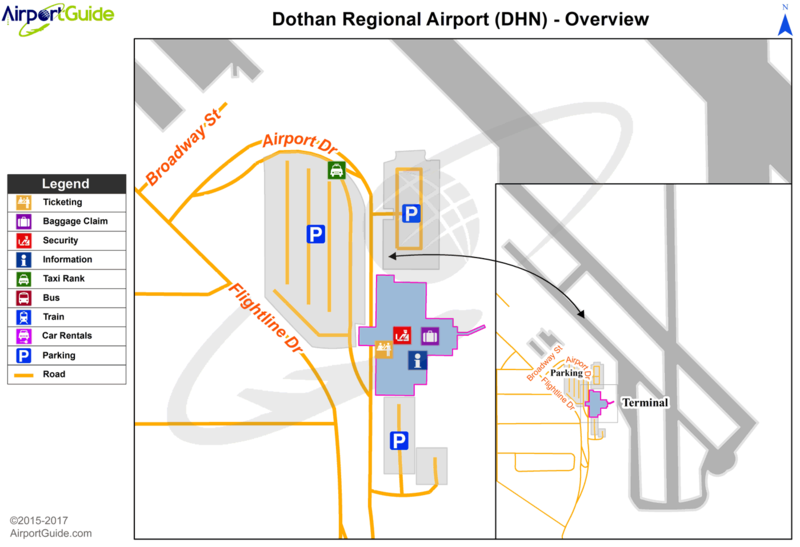 A110-6 LN OF SIGHT FROM DOTHAN ATC TO A PTN OF TXY BRAVO BTN TXY ALPHA AND THE APCH END OF RWY 36 OBSTD BY THE AP BLDG. A24 MISC: LDG FEE FOR ACFT OVER 12500 LBS. A26 48 HR PPR FOR UNSKED ACR OPNS WITH MORE THAN 30 PSGR SEATS 2300-0600 CALL AMGR 334-983-8100. A81-APT WHEN ATCT CLSD, ACTVT MALSR RWY 32; PAPI & REIL RWY 14 AND HIRL RWY 14/32 - CTAF. 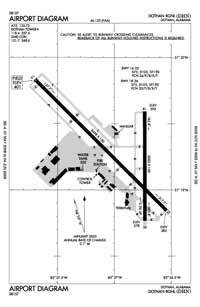 HIRL RWY 18/36 & PAPI RWY 18 AVBL BY PRIOR REQ DURG ATTENDED HRS CALL 334-983-8100/8103. REIL RWY 18 OPER BY ATCT WHEN RWY 18 IS ACTIVE. E111 ARPT CONST BEFORE FAA ACT NO AIRSPACE ACTION ON FILE IN AREA OFFICE. Dual Wheel Landing Gear: 105.